Anyone who likes their morning toast to be just so will understand the importance of an effective toaster. Our collection of KitchenAid toasters is perfectly tailored to the demands of the toast connoisseur, and not only do these deluxe toasters whip up a round of toast in super-rapid time, but they’re also extremely adept at browning your bread to the exact level you like. With a KitchenAid toaster morning-ruining burnt toast will be a thing of the past! An array of additional features will add precision, speed and fine-tuned toasting excellence to your kitchen. Our models come with a handy LED countdown timer that lets you know exactly how long it is before your toast is ready, and a warming feature that keeps your toast heated until you remove it. 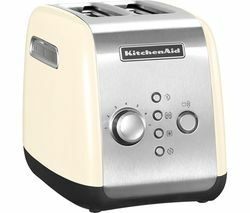 The KitchenAid 5KMT4205BMS Artisan 4-Slice Toaster has talents that extend beyond straight forward bread toasting – a sandwich function and supplied sandwich rack make it easy to prepare delicious toasted sandwiches, too. 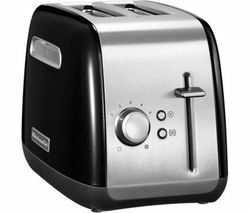 Beyond KitchenAid’s stylish models, our extensive collection of toasters includes the latest Bosch toasters and Morphy Richards toasters. Take a look at our full range today.